Justly celebrated for its limestone countryside the Yorkshire Dales also contains some fine gritstone scenery, including the famous Brimham Rocks, perhaps the finest gritstone playground in the country. Brimham Rocks is situated in the Nidderdale Area of Outstanding Natural Beauty and in many ways Nidderdale is the gritstone dale. 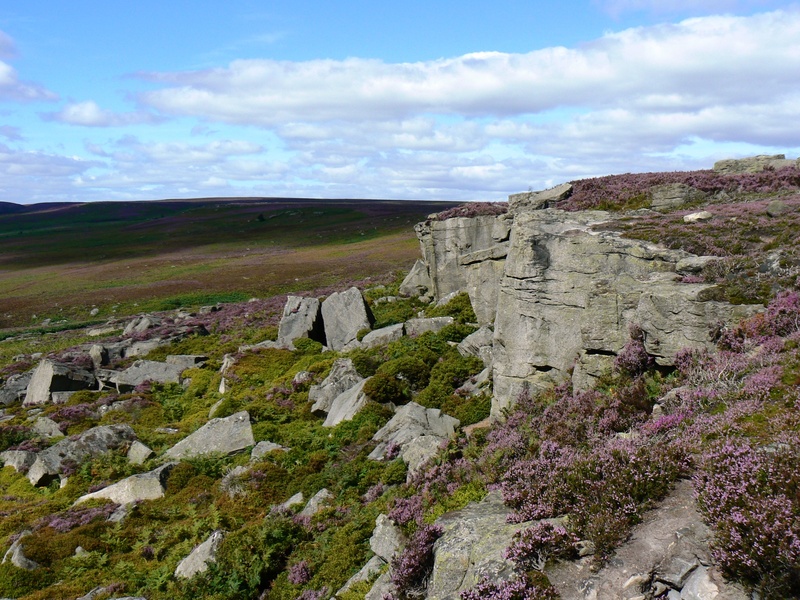 Indeed the majority of gritstone outcrops to be found in the Yorkshire Dales are on the moors running along the eastern edge of the Dales and in the periphery of the region, especially in lower Wharfedale where the ever popular climbing venues Almscliff Crag and Caley Crags can be found. Within the actual boundary of the Yorkshire Dales National Park the finest gritstone crags are to be found on the heather moors either side of the River Wharfe between Burnsall and Bolton Bridge. To the east of the river is the gritstone clad summit of Simon’s Seat while to the west, on Barden Moor and Embsay Moor, are numerous outcrops including Crookrise Crag, Rylstone Edge and the fabulous Deer Gallows. Even in the Three Peaks area, limestone country par excellence, gritstone often makes a dramatic and sudden appearance. Notable examples include the sudden and obvious change in rock type from limestone to gritstone on the upper reaches of Pen-y-ghent and Ingleborough. The links below provide further information on such well known spots as Brimham Rocks and Caley Crags, together with some unsung gems such as Sypeland Crags and, one of my personal favourites, the Wig Stones.